Tennessee-based singer/songwriter Mark Wagner has received many accolades since he first took to the road. His rich acoustic music skilfully integrates the soulful sound of Stevie Wonder with the eloquent poetry of an Andrew Peterson while his latest album 'NeedLove' is a powerful musical statement intended to help women at risk in Ethiopia. Down the years Mark has travelled tens of thousands of miles playing in coffee houses, churches and just about anywhere else. Mark took time off from his busy schedule to answer some Cross Rhythms questions. He began by speaking about the pressure of being an artist with a passionate desire to communicate spiritual truth. "There is great tension there. One of the challenges of being a Christian artist and trying to communicate truth to the masses is living in that tension of 'self-promotion' versus proclaiming the truth. I think it's important to use language that anyone can relate to. However, I'm always intentional about not compromising the real message. I want to tell people what Jesus has done in my own life, and let them know that he can do the same in theirs. That's not a threatening message. I'm just telling God's story and how I fit into it." Mark was raised in a small town in eastern Tennessee called Maryville. "I grew up in the Church, and both of my parents are believers, as is my older sister Katie who is three years older than me. Our family is close and we still spend a lot of time together. I was baptised when I was seven years old, and really began to learn about following Christ when I was 12. I began learning about a personal relationship with Jesus in high school, and was deeply impacted by my Young Life leader, Tim Teague. He really began to show me how important time alone with our Creator is, and also the importance of loving others! I was very involved in my church youth group. My second year in college I began playing music at Young Life camps around the country and I still do that every summer. It has been a joy to share these songs and love kids all over the world!" A couple of Young Life musicians who were a major influence on Mark were Ed Cash (later to become a renowned producer) and Ryan Long. Remembered Mark, "I was playing in a band in high school and we toured all over the South Eastern United States. 'While I'm Here' was my first solo release and after that I began touring as a solo artist. Recording 'While I'm Here' was a unique 'do it yourself' experience. I played most of the instruments on that album, and looking back I wished I hadn't! It was a learning experience, and after we finished that album I knew I'd be working the rest of my life to make better albums every few years! I was hooked!" Mark's second independent release 'Where We Are' was a major improvement. The songsmith recalled, "I went into the studio with three of my favourite session musicians, Dan Needham, Calvin Turner and Clint Milburn. We hunkered down in the studio at my university (Middle Tennessee State University) for an entire day and worked out the songs. Then, we basically just hit record and jammed for eight hours. It was a blast, and I think the energy of that EP really reflects the process." The following year Mark released the album 'Sun's Gonna Rise'. He commented, "This was the first project that I did not produce. 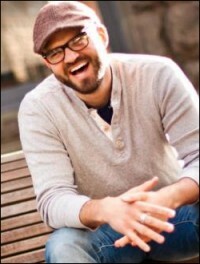 Ben Shive (who has now worked with several other major artists, Andrew Peterson, Sara Groves, Matt Wertz, Bebo Norman) produced with album and he did an amazing job. Ben really helped me become a better songwriter and really taught me how to make a great album! We worked on this album for over a year, and I wrote about 40 songs that we eventually narrowed down to 11. This is my favourite album to date!" After the critical acclaim 'Sun's Gonna Rise' received, Mark began to attract the attention of record labels but it was another independent album, 'Long Way From Montana', that the singer/songwriter released in 2009. He said, "I had been offered a record contract in Montana the year before and declined. It wasn't the right place or time. I went back to Nashville and recorded this album in my home studio with some friends. It was another fun do it yourself project. Several of the songs on that album reflect my experience with the label in Montana." 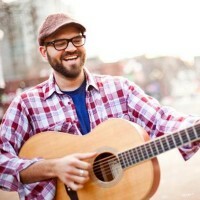 It was Mark's annual work with Young Life that led to his next recording, 2010's 'Live In Canada'. He said, "It was recorded live at a Young Life Camp in Canada called Malibu Club. I was up there in the spring playing for a week and recorded this album. I visit Malibu Club every year and share these songs with high school folks from all over the country. Young Life is a great mission." Over the years Mark had become involved with the Mocha Club supporting women at risk in Ethiopia and his next album was a free project, 'NeedLove', offered to raise awareness of Mocha's work. Commented Mark, "It's important to be a part of something bigger than yourself. We all have our own needs, but it can be a life-changing experience to look beyond yourself and get involved in the lives of others. There is great need all over the world and Mocha Club is just one example of a great organisation that is offering an easy way to get involved." The album, with production from Ben Shive, also brought in songwriters Andrew Osenga of Caedmon's Call and Mark Trussell. One of the outstanding tracks on 'NeedLove' was a cover of the Rich Mullins classic "Creed". Was Mark nervous about covering Mullins' epic song? "No. Ben grew up listening to Rich Mullins, and most of the guys that played on the record also played on several of Rich's records. I asked their permission, and they gave me the okay. We had a blast recording that song as the original Mullin's tune was very formative in all of our spiritual journeys." Mark continues to work hard on his songwriting craft and his passion connect with his listeners is still encouragingly intact, even after six long years on the road. He commented, "There is great joy in proclaiming the message of Christ's love, and my hope is that the joy of Christ is reflected in my life and in these songs. There is hope for all in Christ Jesus, and music is a great language through which to communicate that message."